The Disability History Association is pleased to announce its 8th annual Outstanding Publication Award. Submissions are welcome from scholars in all fields who engage in work relating to the history of disability. Initially, from 2012 to 2017, the award alternated between books and peer-reviewed articles or book chapters. The DHA award committees now award both the Outstanding Book and the Outstanding Article/Book Chapter prizes each year. Although the awards are open to all authors covering all geographic areas and time periods, publications must be in English, must have significant historical content, and must have a publication date within the year preceding the submission date (i.e., 2018 for the 2019 award cycle). Book submissions may be single- or multiple-authored and may be a single monograph or an edited collection, provided the latter contains new and original scholarship. Articles may also be single- or multiple-authored and must be published in books or in peer-reviewed academic journals. The amount of the book award is $300 for the winner and $100 for the honorable mention. The amount of the article/book chapter award is $200 for the winner and $100 for the honorable mention. Authors should arrange for copies of the book or article to be delivered directly to the award committee by no later than May 1 of each year. Submissions may be sent electronically in a format compatible with screen reading software, such as a .doc file or a text-based .pdf. Submissions may also be sent in hard copy. Please follow the updated 2019 instructions for the book award and the article/book chapter award. The Disability History Association will announce the recipient of the DHA Outstanding Book and Article/Book Chapter Awards in September. Laurel Daen, “Martha Ann Honeywell: Art, Performance, and Disability in the Early Republic,” Journal of the Early Republic 37, no.2 (2017): 225-250. Russell Johnson, “‘Better Gestures’: A Disability History Perspective on the Transition from (Silent) Movies to Talkies in the United States,” Journal of Social History 51, no. 1 (Fall 2017): 1–26. 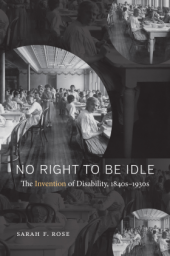 Sarah F. Rose, No Right to Be Idle: The Invention of Disability, 1840s-1930s (Chapel Hill: The University of North Carolina Press, 2017). 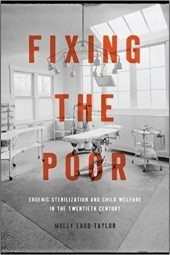 Molly Ladd-Taylor, Fixing the Poor: Eugenic Sterilization and Child Welfare in the Twentieth Century (Baltimore: Johns Hopkins University Press, 2017). Laura Micheletti Puaca, “The Largest Occupational Group of All the Disabled: Homemakers with Disabilities and Vocational Rehabilitation in Postwar America,” in Disabling Domesticity, ed. Michael Rembis (New York: Palgrave Macmillan, 2016), 73-102. Rabia Belt, “Ballots for Bullets? : Disabled Veterans and the Right to Vote,” Stanford Law Review 69 (February 2017): 435-490. Sarah Handley-Cousins, “‘Wrestling at the Gates of Death’: Joshua Lawrence Chamberlain and Nonvisible Disability in the Post-Civil War North,” The Journal of the Civil War Era 6 (June 2016): 220-242. 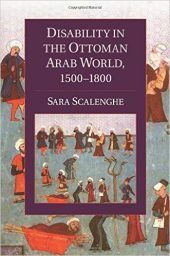 Sara Scalenghe, Disability in the Ottoman Arab World, 1500-1800 (New York: Cambridge University Press, 2014). 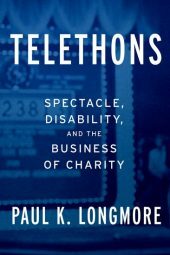 Paul K. Longmore, Telethons: Spectacle, Disability, and the Business of Charity (New York: Oxford University Press, 2016). Dea H. Boster, “‘I Made Up My Mind to Act Both Deaf and Dumb’: Displays of Disability and Slave Resistance in the Antebellum American South,” in Disability and Passing: Blurring the Lines of Identity, ed. Jeffrey A. Brune and Daniel J. Wilson (Philadelphia: Temple University Press, 2013), 71-98. Daniel Blackie, “Disability, Dependency and the Family in the Early United States,” in Disability Histories, ed. Susan Burch and Michael Rembis (Urbana: University of Illinois Press, 2014), 17-34. Stacy Clifford, “The Capacity Contract: Locke, Disability, and the Political Exclusion of ‘Idiots’,” Politics, Groups, and Identities 2 (2014): 90-103. 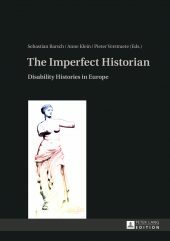 Sebastian Barsch, Anne Klein, and Pieter Verstraete, eds., The Imperfect Historian: Disability Histories in Europe (Frankfurt am Main: Peter Lang, 2013). Audra Jennings, “‘An Emblem of Distinction’: The Politics of Disability Entitlement, 1940-1950,” in Veterans’ Policies, Veterans’ Politics: New Perspectives on Veterans in the Modern United States, ed. Stephen R. Ortiz (Gainesville: University Press of Florida, 2012), 94-116. Jay Dolmage, “Disabled Upon Arrival: The Rhetorical Construction of Race and Disability at Ellis Island,” Cultural Critique 77 (Winter 2011): 24-69. Douglas C. Baynton, “‘These Pushful Days’: Time and Disability in the Age of Eugenics,” Health and History 13, no. 2 (2011): 43-64. David Serlin, “Carney Landis and the Psychosexual Landscape of Touch in Mid-20th-Century America,” History of Psychology 15, no. 3 (August 2012): 209-216. 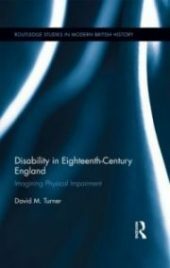 David M. Turner, Disability in Eighteenth-Century England: Imagining Physical Impairment (New York: Routledge, 2012). The selection committee very much appreciated the book’s wide scope, deep engagement with disability history and theory, and the ways Turner used archival sources both to make an overarching argument and reveal individual stories from both elites and the lower classes. Disability in Eighteenth-Century England weaved the ideas of popular culture and individual representation together in nuanced and often humorous, but always respectful, ways. Turner’s witty and very readable prose combined with his thorough analysis of archival material make Disability in Eighteenth-Century England as a must-read for students and specialists.